A CHOICE Outstanding Academic Title 2014! That health has many social determinants is well established and a myriad range of structural factors – social, cultural, political, economic, and environmental – are now known to impact on population well-being. Public health practice has started exploring and responding to a range of health-related challenges from a structural paradigm, including individual and population vulnerability to infection with HIV and AIDS, injury-prevention, obesity, and smoking cessation. Recognising the inadequacy of public health responses that focus solely on individual behaviour change to improve population health outcomes, this text promotes a more holistic approach. Discussing the structural factors related to health and well-being that are both within and outside of an individual’s control, it explores what form structural approaches can take, the underlying theory of structure as a risk factor and the local realities, environments, and priorities that public health practitioners need to take into consideration. 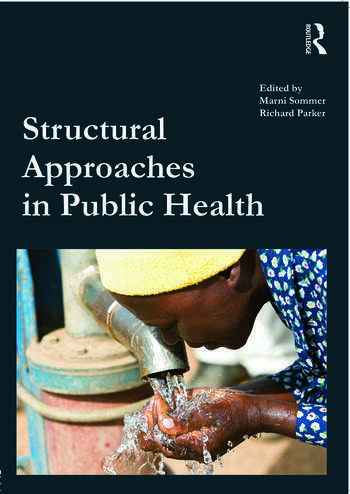 Anchored in empirical evidence, the book provides case studies of innovative and influential interventions – from the 100% condom program, to urban planning, injury prevention, and the provision of adequate clean drinking water and sanitation systems – and concludes with a section on implementing and evaluating structural public health programs. Marni Sommer is Assistant Professor of Sociomedical Sciences, and Director of the Global Health Track for the Department of Sociomedical Sciences, at Columbia University’s Mailman School of Public Health, USA. She is the Executive Editor of the journal Global Public Health. Richard Parker is Professor of Sociomedical Sciences and Anthropology, and Director of the Center for the Study of Culture, Politics, and Health at Columbia University, USA. He is Editor-in-Chief of the journal Global Public Health.